Heard of MPA (Marine protected area) and would that be of interest … here is what I read recently on that ! Palmyra was an ancient Aramaic city in central Syria. Draped in antiquity, it was an important city located in an oasis 215 km northeast of Damascus and 180 km southwest of the Euphrates. Though the ancient site fell into disuse after the 16th century, it is still known as Tadmor in Arabic. An oasis in the Syrian desert, Palmyra contains the monumental ruins of a great city that was one of the most important cultural centres of the ancient world. There are more places named so – the one in US - Palmyra is an incorporated territory of the United States (the only such territory in existence since 1959), meaning that it is subject to all provisions of the U.S. Constitution and is permanently under American sovereignty. However, since Palmyra is also an unorganized territory, there is no Act of Congress specifying how Palmyra should be governed. Palmyra Atoll has no permanent residents, is an unoccupied equatorial Northern Pacific atoll. The variable temporary population of 4–20 "non-occupants" are staff and scientists employed by various departments of the US government and The Nature Conservancy. Palmyra is one of the Northern Line Islands (southeast of Kingman Reef and north of Kiribati Line Islands). The atoll consists of an extensive reef, two shallow lagoons, and some 50 sand and reef-rock islets and bars covered with vegetation—mostly coconut trees, Scaevola, and tall Pisonia trees. The islets of the atoll are mostly connected. Palmyra was first sighted in 1798 by captain Edmund Fanning of Stonington, Connecticut, master of the American merchant ship Betsy, on a voyage to Asia. On November 7, 1802, USS Palmyra under Captain Sawle was shipwrecked on the reef, which was given the name of this vessel. The place is in news now due to the plans of US to create the world's biggest marine protected area (MPA) in the middle of the Pacific Ocean. Newspaper reports state that the White House will extend an existing protected area, known as the Pacific Remote Islands Marine National Monument. Fishing and drilling would be banned from an area that could eventually cover two million sq km. The extended zone would double the world's fully protected marine reserves. President Obama announced his intent to make a broad swath of the central Pacific Ocean off-limits to fishing, energy exploration and other activities. The proposal, slated to go into effect later this year after a comment period, could create the world’s largest marine sanctuary and double the area of ocean globally that is fully protected. “I’m going to use my authority to protect some of our nation’s most precious marine landscapes,” Obama said in a video to participants at a State Department conference, adding that while the ocean is being degraded, “We cannot afford to let that happen. That’s why the United States is leading the fight to protect our oceans.” The announcement — first reported by The Washington Post — is part of a broader push on maritime issues by an administration that has generally favoured other environmental priorities. The oceans effort, led by Secretary of State John F. Kerry and White House counsellor John D. Podesta, is likely to spark a new political battle with Republicans over the scope of Obama’s executive powers. The report states that Obama has used his executive authority 11 times to safeguard areas on land, but scientists and activists have been pressing him to do the same for untouched underwater regions. President George W. Bush holds the record for creating U.S. marine monuments, declaring four during his second term, including the one that Obama plans to expand. Under the proposal, according to two independent analyses, the Pacific Remote Islands Marine National Monument would be expanded from almost 87,000 square miles to nearly 782,000 square miles — all of it adjacent to seven islands and atolls controlled by the United States. The designation would include waters up to 200 nautical miles offshore from the territories. Obama has faced criticism from a variety of groups — including cattle ranchers, law enforcement officers and ATV enthusiasts — over his expansion of protections for federal lands. The ocean area under consideration, by contrast, encompasses uninhabited islands in a remote region with sparse economic activity. Even so, the designation is expected to face objections from the U.S. tuna fleet that operates in the region. Fish caught in the area account for up to 3 percent of the annual U.S. tuna catch in the western and central Pacific, according to the Pew Charitable Trusts. When Bush created the monument in 2009, he exempted sport fishing to address industry opposition. The Pacific Remote Islands Area is controlled by the US and consists of seven scattered islands, atolls and reefs that lie between Hawaii and American Samoa. Essentially uninhabited, the waters that surround these remote islands are home to a wide range of species including corals, seabirds, sharks and vegetation not found anywhere else in the world. What the announcement of Obama signals is that the area when so designated would be off limits to fishing and mineral exploitation to the limit of US economic control - some 200 nautical miles around the islands. 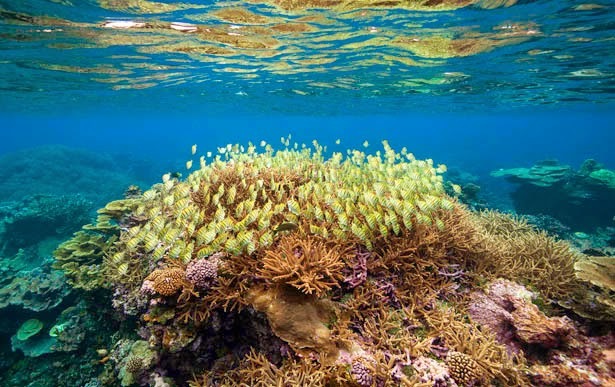 It is stated that tropical coral reefs and associated ecosystems which reportedly are facing the most serious threat from climate change and ocean acidification, would benefit from this move. The post further reflects that conserving marine species isn't just the preserve of large nations like the US. In recent days the tiny Republic of Kiribati announced that the Phoenix Islands Protected Area, will close to all commercial fishing by the end of 2014. recently, plans to create two huge marine sanctuaries in Antarctica failed for a third time, after Russia again headed nations which blocked the bids. The meeting of the Commission for the Conservation of Antarctic Marine Living Resources in Australia had sought to protect the Ross Sea and an area off East Antarctica from exploitation. But delegates from 24 countries, plus the EU, failed to reach a consensus. It appears that lot is happening under the bridge – in the waves on the sea front.